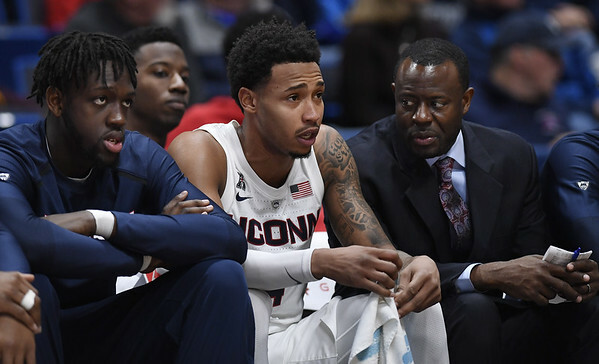 STORRS - UConn leading scorer Jalen Adams will be out the next four to six weeks because of a knee injury suffered during the Huskies’ loss to Temple on Wednesday. The school announced Friday that an MRI confirmed the senior guard sprained the MCL in his left knee. Adams, averaging 17 points per game, was injured just under six minutes into the game when Temple's J.P. Moorman II fell on Adams’ leg in a scramble near the basket. Adams had to be helped to the locker room by a teammate. Temple went on to beat the Huskies 81-63. Posted in New Britain Herald, UConn on Friday, 8 February 2019 21:37. Updated: Friday, 8 February 2019 21:39.